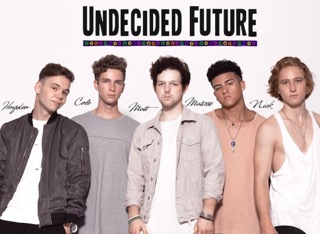 LOS ANGELES, CA – One of the hottest and fastest-rising young groups in music today is Undecided Future. The winners of Ryan Seacrest’s “Best Cover Ever” were hand-picked by Jason Derulo and Ludacris from among 4,000 other contestants. As part of their reward, they were able to join Derulo in a performance seen by millions worldwide. They’ve racked up more than 140,000 Spotify streams for their song “Intoxicated.” And they’ve spent 18 weeks at No. 1 on Reverbnation’s Southern California Chart. You can always catch them LIVE, as they currently have a performance contract to play at Downtown Disney until early 2019. Today, this five-member funk-driven pop band with a creatively executed underlying element of hip-hop and R&B is launching their latest single, “U.” It’s the debut single from their new EP “JUGO,” which was put together through collaboration with Grammy-winning producer Dem Jointz – who has worked with Rhianna, Christina Aguilera and Dr. Dre to name a few. Described as “sweet juice from each member of the band,” the concept behind “JUGO” highlights the individual talent of each band member, while also presenting sounds that can cater to any demographic. “U” is a pop/funk song that is fast becoming a crowd favorite. The up-tempo beats and mixture of lead vocalist Matt Isaac is a classic song with feel good vibes. This group of multi-talented Southern California beach city guys first met during their freshman and sophomore years of high school. They graduated from a performing arts school called Orange County School of the Arts, located in Santa Ana, California. Matt Isaac, lead vocals, and Matisse Pasillas, drums and backup vocals, wanted to form a band. They were inspired by their fathers – Isaac’s was a leader singer in a Rockabilly band and Pasillas’ is a professional drummer and percussionist. They found Cole Fredrick, guitar and backup vocals, Nick Stone, keyboard and backup vocals, and Hayden Lyskoski, bass and backup vocals. They had their first rehearsal in Pasillas’ garage and everything just clicked. “JUGO” is currently available on all digital distribution sites. It’s a project that showcases maturity in their songwriting, a rhythm section with a deep pocket, and impressive falsetto vocal acrobatics from front-man Isaac. The standout single from the project is a song called “U,” which was written out of a heavy influence of artists of the 70s and 80s. According to Isaac, it’s a song that has a special significance because it holds true to the group’s roots of music.